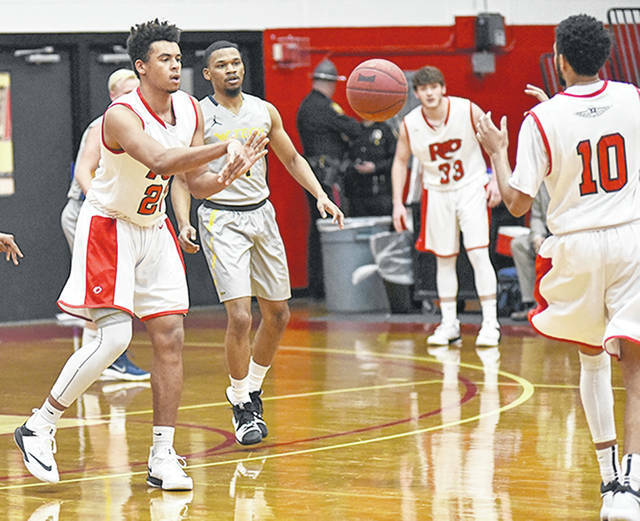 Rio Grande’s Greg Wallace (making pass) and the rest of the RedStorm were picked sixth overall and third in the East Division of the River States Conference Men’s Basketball preseason coaches’ poll, which was released Tuesday by the league office. MIDDLETOWN, Ohio — The University of Rio Grande is picked third in the East Division and sixth overall in the 2018-19 River States Conference Men’s Basketball Preseason Coaches’ Poll. The poll, along with the preseason All-Conference Team, was released on Tuesday as part of the league’s Media Day activities. Head coach Ken French’s squad totaled 76 points in the overall balloting of the conference’s 13 head coaches, while picking up 43 points in the East Division voting. The RedStorm finished 10-20 overall last season and were fifth in the East Division with a 5-12 record, falling one game short of qualifying for the league’s post-season tournament. Only five players, led by sophomore guard Trey Kelley (Minford, OH) and junior swingman Greg Wallace (Montego Bay, Jamaica), return from last season’s team. Kelley averaged 7.2 points and shot 37.6 percent from three-point range, while Wallace averaged 5.3 points and 4.8 rebounds per outing. Rio Grande finds itself behind Indiana University East and West Virginia University-Tech, who finished 1-2 in both the overall and East Division voting. IU East, which has won back to back RSC Tournament championships, received seven of the 13 first-place votes and finished with 139 total points. The Red Wolves made it to the NAIA Division II national semifinals last year to continue a stretch of three consecutive years in making a deep run at nationals. IU East entered the national tourney as the No. 1-ranked team in the country last year before losing in the semifinals to eventual champion Indiana Wesleyan. WVU Tech received five first-place votes in the overall poll tallied 134 points. The Golden Bears reached the national tournament last year and ended the season ranked No. 25 in the nation. WVU Tech advanced to the semifinals of the RSC Tournament, and it returns this year several players from the 20-win team, including some key pieces who were out all year with injuries. In the divisional voting, the Red Wolves received seven first-place votes and 62 total points. WVU Tech had six first-place votes and 61 total points. Indiana University Southeast placed third in the overall poll with 126 points. The Grenadiers, who got the remaining first-place vote from the coaches, is coming off a 24-9 campaign that included a No. 13 final ranking in the Top 25. IU Southeast reached the RSC Tournament finals and made the second round of the national tournament. The Grenadiers were the clear favorite in the RSC West Division with 12 of the 13 first-place votes and 78 total points. Asbury (Ky.) University was picked second in the West Division and fourth overall. The Eagles were 17-12 last year and return RSC Player of the Year Trenton Thompson, who ranked second in the nation in scoring at 26.4 ppg. Asbury received one first-place vote in the division and 109 total votes in the overall poll. Brescia (Ky.) University was picked fifth overall and third in the RSC West Division. The Bearcats return two preseason all-conference picks this year. Cincinnati Christian University is picked as the fourth – and final – playoff team out of the West and eighth overall. Indiana University Kokomo, Alice Lloyd (Ky.) College and Midway (Ky.) University rounded out the West Division voting. Also predicted to join IU East, WVU Tech and Rio Grande as tourney teams from the East Division is Ohio Christian University. The Trailblazers edged out Carlow (Pa.) University by a single vote for fourth place in the preseason poll. Ohio Christian and Carlow, a playoff qualifier last year, tied for 10th in the overall poll. Point Park finished up the RSC East predictions. Asbury’s Thompson led the 10-player All-RSC preseason team. WVU Tech had a league-best three selections, while Brescia (Ky.) University finished with two.